Capablanca y Graupera was born in November 19, 1888 and died on March 8, 1942. He was a Cuban world-class chess player of the mid-twentieth century. He held the title of world chess champion from 1921 to 1927 and was also a highly-regarded chess writer. In 1909, at the age of 20, Capablanca won against US champion Frank Marshall by +8-1=14 which was one of his greatest wins of all times. Then, in a tournament at New York 1911, Capablanca placed 2nd behind Marshall. So Marshall insisted Capablanca should play in a tournament at San Sebastian, Spain in 1911. It was one of the toughest tournaments of that time. All of the world's leading players marked their appearance where Ossip Bernstein and Aaron Nimzowitsch objected to Capablanca’s presence as he hadn't won any other tournaments. But he was allowed to play his first round against Bernstein and had a brilliant win over him which forced Bernstein to acknowledge Capablanca’s talent. Nimzowitsch took offense when Capablanca made a comment that unproven players should hold their tongue in the presence of higher players. Capablanca quickly challenged Nimzowitsch for a series of fast games and won with ridiculous ease. 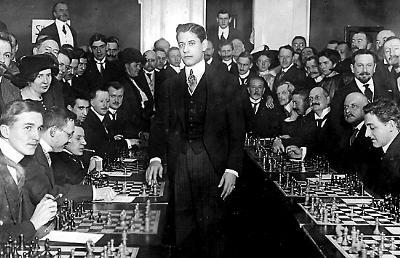 The assembled masters of the game applauded Capablanca. After which Capablanca went on to win the tournament at San Sebastian and this is considered to be his one of the greatest achievements in his chess career. Capablanca plays the Ruy Lopez Opening. Transposing to the Berlin Defense. White takes the exchange option. Many people say the bishop is better than the knight but now Black's pawn formation is compromised. Black doesn't want to play c5 as this will weaken his control on d5. Compelling the bishop to make a decision. Bishop chooses discretion as the better part of valor. Discovered attack on the bishop. White is determined to keep a knight on e4. Again the second knight stands as a ready replacement for his partner should he be needed. Black finally accepts the pawn but now his queen is away from the main battlefield. The queen is offered a second pawn in exchange for another tempo. White's knight's moving towards the enemy king. The queen has regained a central position but is still locked out of the kingside by the knight on h5. White drives the queen away. Now White has achieved a material lead. 30.Qc3 f6 31.Nxf6+ Kg6 32.Nh5! Threatening mate and attacking the rook. You can play through this game here. Black answers the King's Opening with the French Defense. White has allowed Black to win more space and his pieces have a cramped look. Black's pieces on the other hand have much more room to breathe. Increasing the heat on h2. Nimzowitsch liked this idea of supporting the king's direct protector with the bishop from the rear. With the extra space, Black's pieces are taking up good positions but White's pieces are looking forlorn. Choosing not to open the space in front of White's miserable pieces. They must continue to suffer. White gives up the knight for two pawns so that he can release himself from Black's crushing advance and establish his bishop on the a2-g8 diagonal with tempo. The knight leaves his post as h2's protector, White is going for broke now. Black must give up the rook for the knight. Not 19...Kg8? because of 20.Qh5 g6 21.Ng5+ Kg7 22.Qxh7+ Kf6 23.Nh3 Bd6+/= and now White has the upperhand. White wants to open up the long diagonal. Almost even in material but White's king is much more exposed. 27.c5 Nce7 28.Bf3 Bb5 29.Rc2 Nf6 30.a4 Bd3 31.Rcc1 Ne4 32.b5? Now it's over with a forced mate ahead. Better was 32.cxb6 axb6 33.d5 Nxd5-+ Still losing but still fighting. Join in and write your own page! It's easy to do. How? Simply click here to return to Jose Raul Capablanca Anecdotes and Games.